I love Ashish Gupta, his namesake label can always be relied upon for fun, sparkles and some light relief during the relentless London schedule. His collections also hold a soft spot for me for personal reasons, his show at Hippodrome was the first ever on-schedule show I attended at London Fashion Week some 12 seasons ago. This season, his collection strikes a chord for different reasons. Almost overnight, post-Brexit Britain has made a lot of ethnic minorities feel uncomfortable – Gupta moved to London in the 90s and said that this is the first time he felt unwelcome in the country he regards as home. 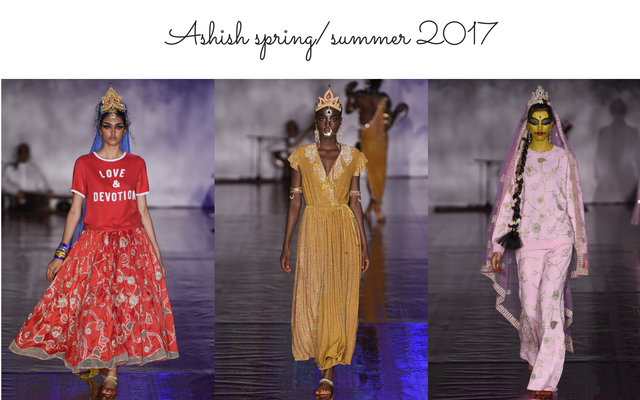 His spring/summer 2017 collection is a beautiful celebration of Indian culture with stunning saris and sherwanis alongside the London uniform of tracksuits and urban streetwear – a bold statement about the fusion of British and Indian culture and belonging. His collection speaks to me due to my own Indian heritage. As a second generationer, I’m acutely aware of walking the line between the culture I grew up with and the culture of my parents and grandparents. I think most people of colour living in Britain are conscious of existing somewhere in the middle of two worlds and trying to carve out an identity somewhere between the two. For me, it’s so beautiful to see a LFW show celebrating Indian culture with Indian styling, including traditional jewellery and plait extensions I used to wear to weddings. To recognise the blue painted faces as the goddess Kali. To see my favourite model Neelam Gill walking the runway. I also loved the beautiful cast of models, white, black, Indian and pretty much everything in between. While diversity in the industry is a hot topic, I’m still appalled at the lack of Indian models fronting campaigns and walking the runway. Props to Ashish for creating such a beautiful collection and celebrating diversity, unity, Indian culture and being British all in one unforgettable collection.